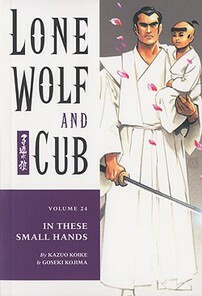 A little boy desperately attempts to drag his ronin father to safely, even if it costs him his own life; that same wandering samurai and his mortal enemy work together to save the frostbitten fingers of the same little boy, knowing they will eventually match swords again in a battle to the death; another samurai bites his own tongue, killing himself and locking a dark secret in his grave. The code of the samurai is complex and rich with irony, which is why so few carry this code through life. But as we draw closer to the conclusion of this epic struggle, the true bushi are stepping forth and showing their colors. It will truly be a fight to the finish. So, in these final days, a ronin and his young boy will visit the grave of their murdered wife and mother. It just might be the last Spring the two will share, like the many petals falling from branches.